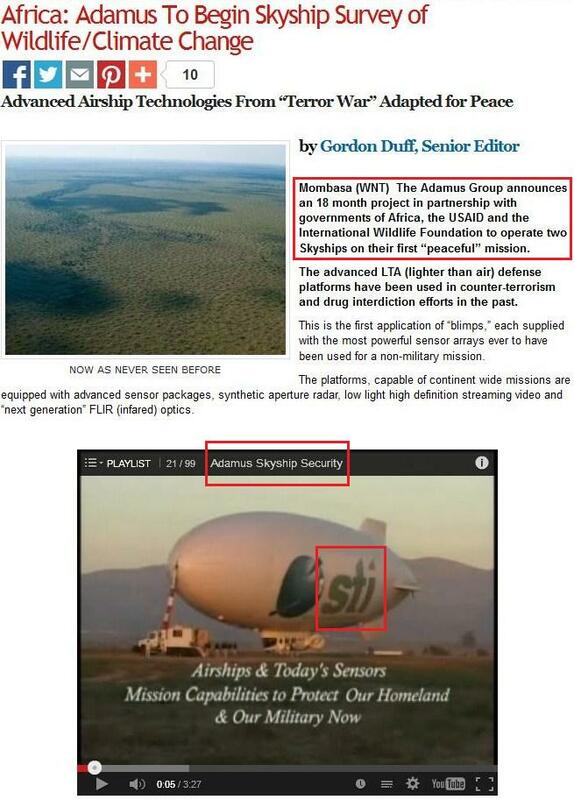 Setting aside, for the moment, what the real agenda might be for putting a military surveillance airship over Africa, have a look at the video attached to the article. To create it, Duff appears to have purloined an old promotional video from Science & Technology International (STI), a Honolulu-based defense contractor that operated airships prior to May 6, 2004 (when it was bought-out by BAE Systems), and injected an old CNN video into the middle of it. In the news crawler at the bottom of the CNN video, a reference is made to Typhoon Etau striking Japan, and that happened in 2003. So both source videos are quite dated. 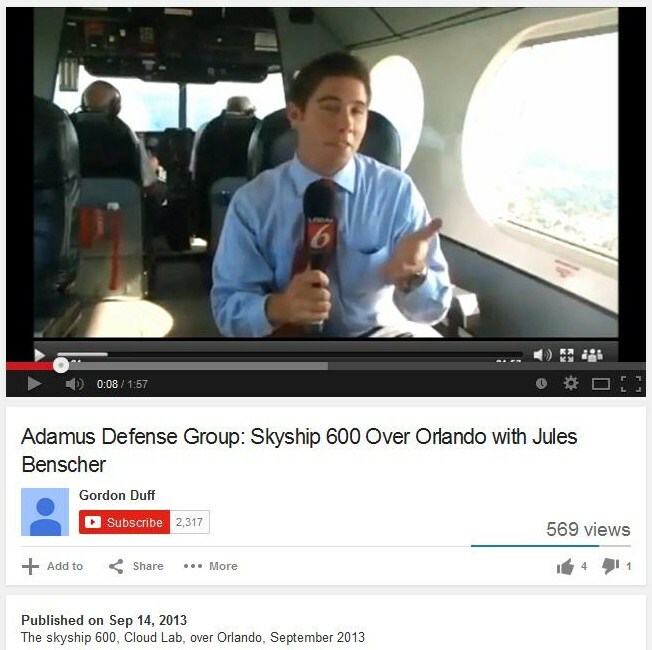 Despite the fact that Adamus had nothing to do with either video, Duff slapped them together and titled the resulting video “Adamus Skyship Security” to create the impression that Adamus was involved. But I’ve found no evidence that Adamus ever had a formal contractual relationship with STI. Therefore, Gordon Duff’s purpose in creating and posting this video seems to be to impress his readers and make it look like Adamus was/is actually active in the airship industry. 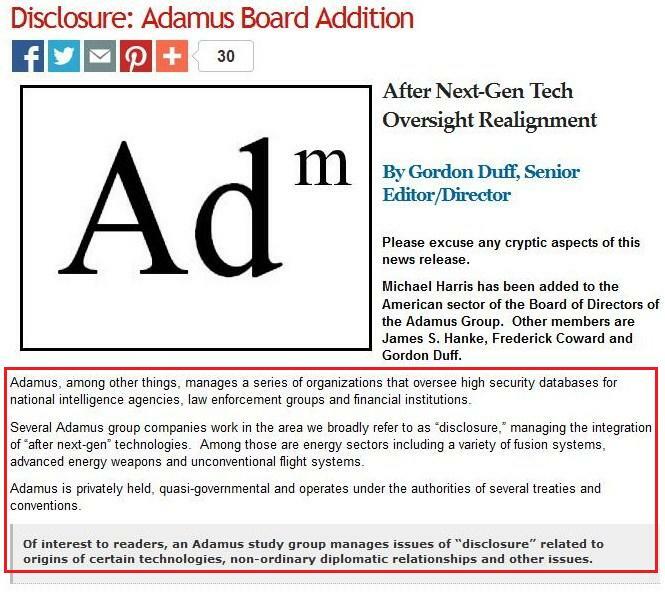 …thus creating the impression that Adamus was involved with what was going on in the video. They were not. >>> Thank you for being so patient while we looked into this query for you. The “not Adamus” in parentheses were their words, not mine. So with this video, Duff is taking credit for the work of others. …you’ll have to ask Gordon Bluff… err… Duff. After all, why would Adamus be trying to put a conventionally fueled, manned blimp over Africa if it had access to all those “after next-gen” technologies? An automated / remotely piloted blimp or anti-gravity craft powered by a fusion reactor could stay aloft indefinitely. Why doesn’t Adamus field something like that? Perhaps because they’re full of sh*t.
…of a purported Adamus Skyship. …and airshipman.com is one of Skyship Services’ web addresses, so this is actually a Skyship Services airship. This means it cannot possibly be an Adamus skyship, because as of last week, Adamus still hasn’t purchased or leased any airships from them. I confirmed this with my airship industry contact. So with this photo, Duff is trying to impress others using someone else’s property. …by implying that Adamus already operates blimps in conjunction with Skyship Services. They do not. 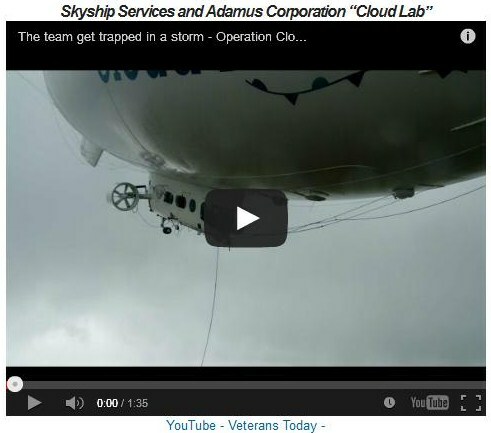 …Duff titles the video, “Skyship Services and Adamus Corporation ‘Cloud Lab,'” but as I’ve already mentioned, Adamus had nothing to do with the Cloud Lab project. So with this video, Duff is trying to impress others using someone else’s project. …So now he is a specialist on African cultural issues too. …Doubting that Adamus had any space-based assets, I queried my airship industry contact on whether he knew if Adamus owned or leased any satellites. In response, I was told that Benscher never actually mentioned “Adamus” satellites; he had simply stated that his airships had the capability of uplinking to satellites. So in this section, Duff misquoted someone to create the impression that Adamus has capabilities they do not, in fact, seem to possess. 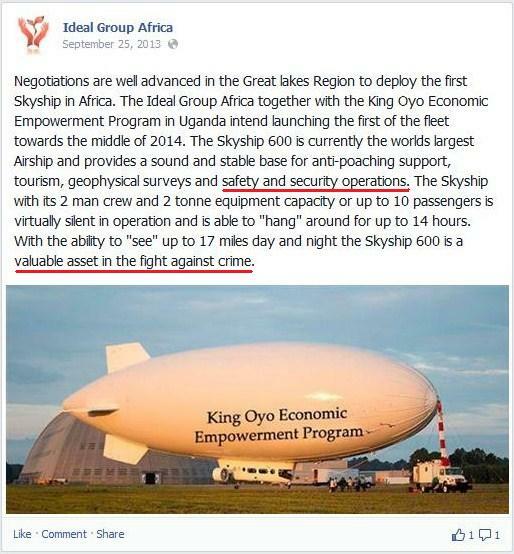 Surveillance Airships over Africa: What’s the Real Reason? 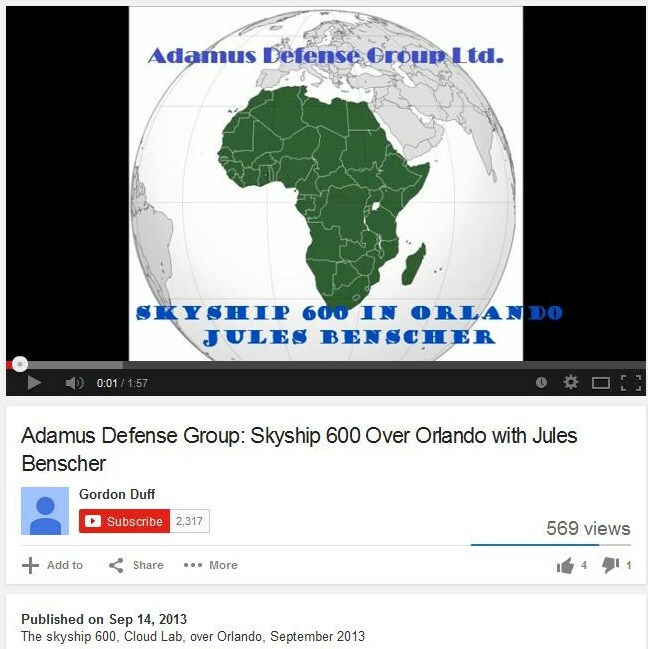 Looking beyond Gordon Duff’s amazing capacity to exaggerate, fabricate, and self-promote, one wonders about Adamus’ real motives in trying to put military surveillance airships over Africa. They first tried to bring in the airships under the pretext of environmental monitoring, but now that the engineered ebola crisis has come along, they’ve dropped that like a hot potato and latched onto a humanitarian pretext instead. The one thing that hasn’t changed about the African airship proposal is the dual-use nature of the airships themselves: once the sensors have been uplinked to satellites, anyone who pays can use the feed for purposes both civilian and military. 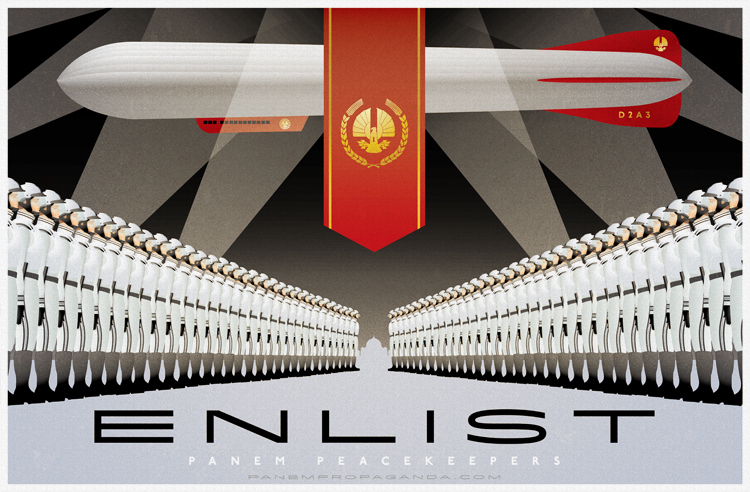 The whole airship proposal reeks of the UN and Agenda 21. And given that Gordon Duff’s “expansive” bio brags of experience in defense contracting, government security consulting, and counterinsurgency, it’s hard to imagine him not selling surveillance data to globalist military interests. The advanced sensor capabilities and long mission durations of the airships would be a great complement to the growing Pentagon drone and ground forces in Africa (which also are using the ebola situation to expand their presence). After looking through all this, my personal take on Adamus is that it’s 95% bluff and bluster, 5% negotiations over African blimp contracts, and 0% black budget / UFO / deep intelligence. So any tales of “White Hat” intrigues, alien species, secret space programs, etc. coming out of Duff and his Veteran’s Today cohorts are profoundly dubious in my view. But I’ll go deeper into this in the next entry. This entry was posted in Globalist Disinfo, Veterans Today on October 22, 2014 by kenneth.